Virtualisation has long been a popular feature among Synology users - and it’s not hard to see why. The company’s modern network attached storage solutions are already capable of far more than just streamlined data storage, and with those new capabilities come with exciting possibilities. Today’s NAS user isn’t solely concerned with safely backing up their data. Modern NAS devices can do so much more, from running a mail-server to web hosting to enabling real-time document collaboration. In fact, according to a 2016 study undertaken by Gartner, up to 80% of x86 server workloads have been virtualised. However, these new possibilities can sometimes open the door to new risks and uncertainties. With anything this technical, it would always be the case. No matter how trusted the developer, there’s always going to be a chance of something breaking or reacting in an unexpected way when you load an unfamiliar application or suspicious software onto your existing NAS configuration. Virtualisation can act as an important buffer here, giving you a sandbox in which you can safely test any new software. This is exactly why Synology offered both Docker and Virtual DSM support with version 6.0 of its flagship DiskStation Manager software. This feature allows professional and enterprise users to isolate their customers’ and internal departments’ services from one another. While other virtual NAS solutions exist, Synology’s multi-tenant approach offered a key point of difference by actively reducing deployment cost while also ensuring data can be easily separated. Given these advantages, it shouldn’t be surprising that the company is expanding further into this frontier of the NAS space by introducing and launching the new and official version of Virtual Machine Manager. Virtual Machine Manager helps you manage IT resources with high flexibility. You can allocate hardware resources such as computing power, storage space, or network interfaces among several virtual machines. What is Synology’s Virtual Machine Manager? A significant upgrade on the capabilities of its predecessor (Virtual DSM Manager), Virtual Machine Manager allows users to set up and run not only virtual DSM instances but also Windows and Linux. For those who are in a single OS environment (such as macOS), VMM provides an easy and painless entry to run applications that are only supported on other operating systems. It also promises to increase server flexibility, giving NAS administrators additional control over the allocation of resources like computing power, storage space or network interfaces. What’s more, if you already run VMs on other hypervisors such as VMware, Hyper-V, or VirtualBox, you can easily import the OVA file or system images into the VMM. Synology’s Virtual Machine Manager supports *.pat, *.iso, *.vmdk, *.vdi, *.vhd, *.vhdx, and *.img formats. Security is also a benefactor here. After all, there is no need to worry about a Virtual DSM being attacked since the physical host will always be intact. VMM protection supports lightning fast snapshots and cloning to help you clone and restore a virtual machine within seconds. What special features does it offer? Synology’s Virtual Machine Manager can be configured to take snapshots as frequently as every five minutes, enabling a closer-to-optimal RTO. As well as serving as a backup measure, you can also use these snapshots to clone your current virtual machine settings and use them as a foundation for a new VM. Synology’s Virtual Machine Manager also supports Live Migration, making it easy to move active VMs from one host to another. Furthermore, the Pro version (currently in Beta) of the Synology Virtual Machine Manager also offers up a VM high availability setting for those who can’t afford downtime. This configures High Availability clusters of three host servers, including one active server, one passive server, and one quorum server to ensure maximum uptime. When the active server is inaccessible or has abnormal status, a failover or switchover can be performed so the passive server takes over the service. Together, these features empower Synology’s NAS-based VM solution, and strike a strong balance between keeping resource allocation flexible while also ensuring maximal service uptime. DS918+ is a 4-bay network attached storage solution equipped with a quad-core processor and 4GB DDR3L memory (expandable up to 8GB). What NAS models are recommended for using Synology’s Virtual Machine Manager? More specifically, they also recommend their new FS1018, which has been launch just recently. 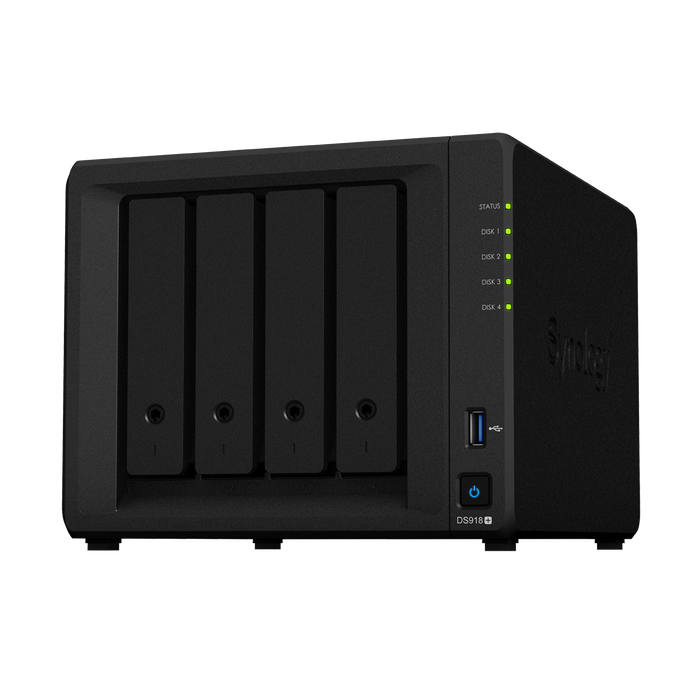 FS1018 is Synology’s first desktop form factor All-Flash NAS. Powered by Intel Pentium D1508 dual-core CPU and 8GB RAM, FS1018 has four Gigabit LAN ports and can be expanded for 10GbE connectivity to reach over 40,000 4K Random Write IOPS. FS1018 is the company's first desktop all-flash NAS. Another popular model is the DS918+, which comes powered by an Intel Celeron J3455 quad-core processor and 4GBs of memory (upgradable to 8GB), supports two M.2 NVMe 2280 SSDs and touts a 4 bay NAS (scalable up to 9 bays with an expansion unit). For more information on the number of virtual machines that you can run on Synology NAS, please visit here. How does Synology’s Virtual Machine Manager compare to the alternatives? 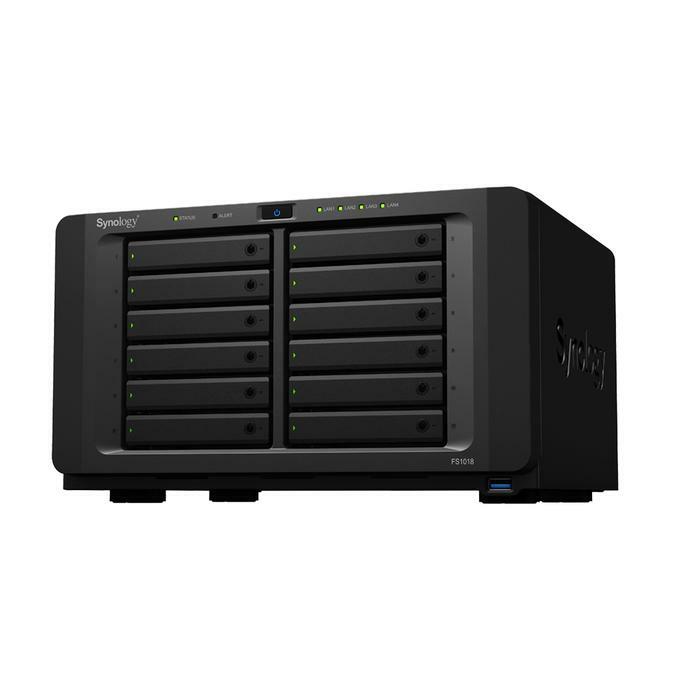 Compared to the QNAP’s Virtualization Station, Synology’s Virtual Manager offers up a similarly-affordable but more powerful solution. 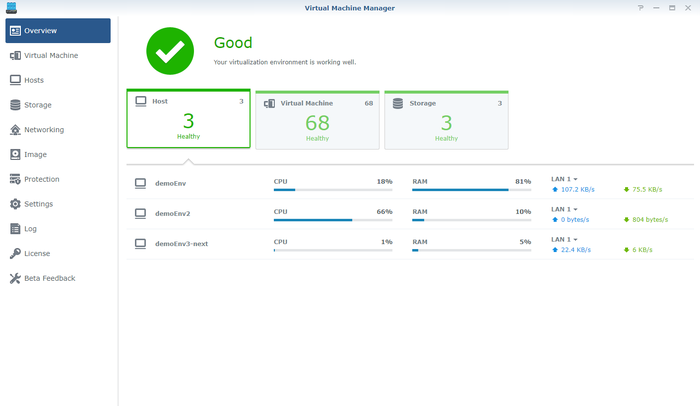 Key features like High Availability clustering, fast failover and live-migration are not supported only on the Synology VMM platform. In addition, Synology’s VMM also touts a more intuitive replication process that allows users to easily move virtual machines between different clusters without first exporting the image file. 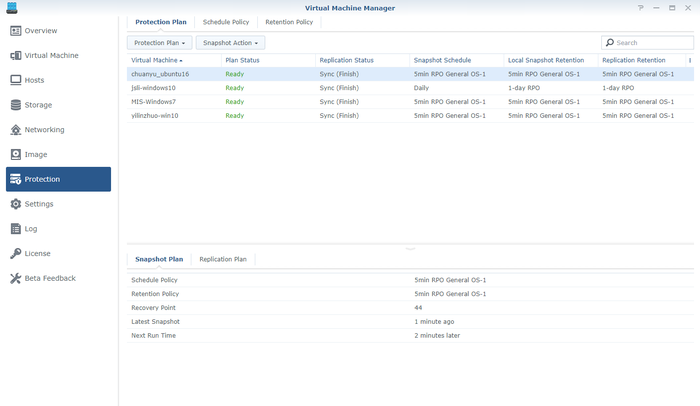 To learn more about Virtual Machine Manager, please visit here.